Benthic foraminiferal stable isotopes (δ18Obf and δ13Cbf) represent an important tool to investigate changes in ocean circulation through time. For my Ph.D., I used δ18Obf and δ13Cbf to reconstruct oceanographic changes in the North Atlantic and in the North Pacific from the middle Eocene to the early Oligocene (~49-33 Ma). The late middle Eocene-early Oligocene (~40-33 Ma) represents one of the most important climatic transitions of the last 50 Mrys (the greenhouse-icehouse transition) because permanent large ice sheets started to appear in Antarctica and temperature started to cool. In Borrelli et al. 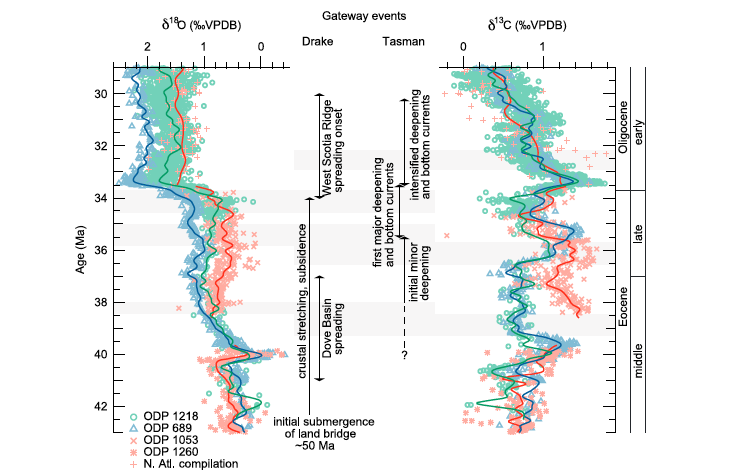 (2014), my colleague and I provide evidence that the opening of the Drake Passage (which isolated Antarctica from South America ~41 Ma) and the Tasman Rise (which isolated Antarctica from Australia beginning prior to ~35.5 Ma) impacted ocean circulation in the Atlantic. In particular, this study shows that a modern-like ocean circulation began in the late middle Eocene (~38.5 Ma), with the development of a bipolar ocean circulation characterized by thermal differentiation between the deepwater mass originating in the Southern Ocean (Southern Component Water – SCW) and the deepwater mass originating in the North Atlantic (Northern Component Water – NCW). In Borrelli and Katz (2015), we focus on ocean circulation in the northwestern Pacific. In this case, the collected data add significant structure to a lower-resolution record from the same location and suggest that the northwestern Pacific was bathed by: 1) a deepwater mass probably originating from the Southern Ocean (~49-43 Ma); 2) a regional warm deepwater mass possibly originating from surface waters downwelling at the higher latitudes of the North Pacific or warm saline deep waters originating at low latitudes (~42-37 Ma); and 3) a deepwater mass originating from the Southern Ocean and bathing other deep Pacific locations (~36.5-34 Ma). The SSU rDNA (small subunit ribosomal DNA) is a widely used tool to reconstruct phylogenetic relationships among foraminiferal species. In Borrelli et al. (Borrelli et al. 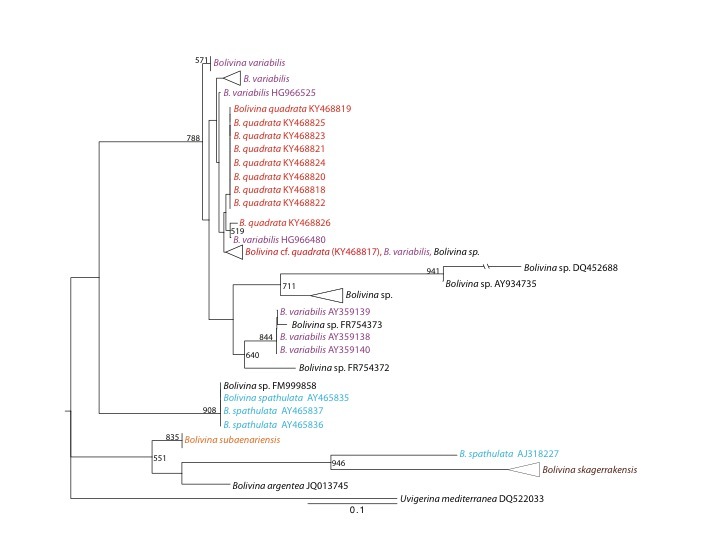 2018a), my colleagues and I evaluate several SSU rDNA hypervariable regions (i.e., 37/f, 41/f, 43/e, and 45/e) as possible DNA barcodes to distinguish among species of the rotaliid genus Bolivina. The study shows that not all the Bolivina species are fully resolved when a single SSU rDNA hypervariable region is used as barcode and that some regions are better than others to distinguish among closely related species. In addition, intraspecific polymorphism analyses reveal a high degree of variability. In the context of barcoding studies, our results emphasize the need to assess the range of intraspecific variability of DNA barcodes prior their application to the identification of foraminiferal species in environmental samples, but they also stress the possibility that a longer SSU rDNA region might be necessary to distinguish among species belonging to the same taxonomic group (i.e., genus). Because of my background in marine biology, I am very interested in exploring the ecology of benthic foraminifera. In Borrelli et al. 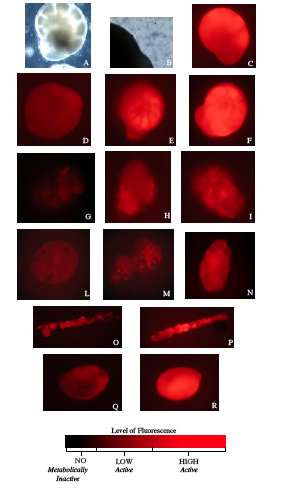 (2011), my colleagues and I explore the possibility to apply the fluorescent in situ hybridization (FISH) technique to identify living foraminiferal cells with an active metabolism using fluorescent probes targeting the SSU rRNA (small subunit ribosomal RNA). In particular, this study targets the most represented benthic species in coastal marine sediments, like the Ammonia group and Miliolids, as well as agglutinated polythalamous (i.e., Leptohalysis scottii and Eggerella scabra) and soft-shelled monothalamous (i.e., Psammophaga sp. and saccamminid morphotypes) taxa extracted from experimental settings and/or from natural samples. Our data indicate that FISH targets only metabolically active foraminifera and that it allows differentiating low vs. high cellular activity based on the intensity of the fluorescent signal emitted by the probe. These results demonstrate the usefulness of the FISH approach as a key tool to investigate the physiology of living foraminifera, in the field as well as in experimental settings. I have always been interested in understanding biomineralization processes in foraminifera. Considering that foraminifera are single-cell organisms, I find fascinating that we know so little about how these organisms precipitate their beautiful shells. In Borrelli et al. (2018b), my colleagues and I show that calcareous benthic foraminifera are capable of agglutinating sedimentary particles also. In particular, we focus on Melonis barleeanus. 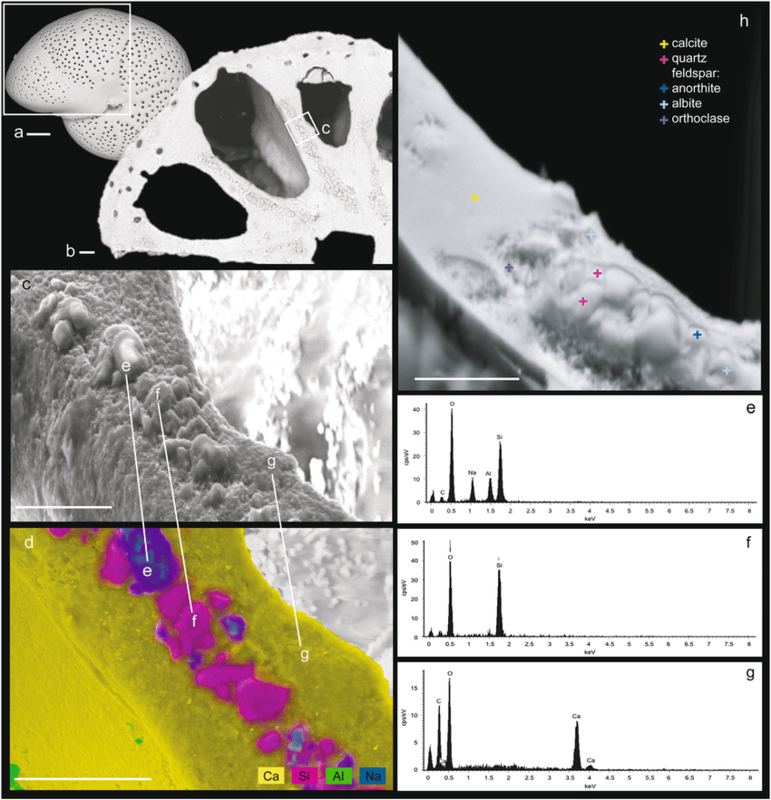 Traditionally considered a calcareous species, our data reveal the presence of minute (~3 μm) sedimentary particles (silicate grains) inside the chamber walls of the examined shells. These particles are arranged in a definitive and systematic pattern, and the similar grain chemical characterization and size suggest a relatively high degree of selectivity in both modern and fossil specimens. Based on these results, we propose that M. barleeanus is capable of agglutinating sedimentary particles during the formation of a new chamber. Considering that the isotopic and chemical composition of this species is widely used in paleoclimatic and paleoceanographic reconstructions, we used a mixing model to investigate the influence of sedimentary particles on M. barleeanus δ18O data. Our model show that the calcite δ18O would increase by ~0.9-2‰ if 10 wt% of feldspars (i.e., anorthite, albite, orthoclase) and quartz, respectively, were included in the analyzed shell. Overall, our results emphasize that it is of paramount importance to consider M. barleeanus unusual biomineralization strategy during the interpretation of geological records and to investigate the presence of similar processes in other calcareous foraminiferal species.